Ovenbirds, also called horneros (or-NEYR-ohz), are small-to medium-sized, rust-to-brown colored birds. They have slender, pointed bills that range in length from short to long. Their wings are relatively short and are rounded or pointed at the tips. Ovenbirds have medium length legs and feet with front toes that are joined at the base. 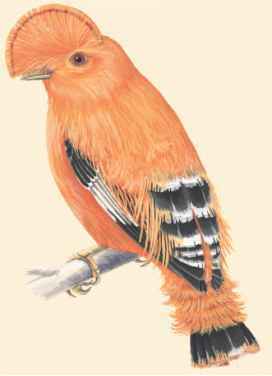 These birds have rufous, reddish, heads and white throats in many species. There is a light stripe over the eyes. They have brownish backs, light brown-and-white speckled or streaked bellies, rufous wings with brownish red or white bands, and rufous tails. Males and females are similarly colored. Adults are 5 to 11 inches (13 to 28 centimeters) long and weigh 0.3 to 1.6 ounces (9 to 46 grams).